Kawasaki, Japan, October 29, 2012 — Fujitsu Laboratories Limited today announced that it has developed a super-wide-angle 3D laser radar with more than double the range (140 degrees both horizontally and vertically) of conventional radars. Ultrasonic wave sensors are already in commercial use in systems that support vehicle parking, for example, to assist drivers when the car is backing into a parking space. However, the detection range is narrow, and multiple sensors were required to widen the area of visibility around a car. By developing a scanning angle expansion lens for the laser beam and a high speed, multipoint laser scanning system for detecting a wide range at high speeds, Fujitsu Laboratories has now roughly doubled the detection range compared to previous sensors to approximately 140 degrees, both horizontally and vertically. As a result, objects can be detected in three dimensions over a wide range with fewer sensors and a sophisticated vehicle backing support system can be created. Moreover, in contrast to vehicle-mounted cameras, which simply display a vehicle's surroundings, the technology enables systems that detect when objects are abnormally close. It also provides warnings to drivers when backing up a vehicle, which is when accidents are more likely to occur, or when backing into a parking space, which is difficult for many drivers. It is hoped, therefore, that this technology can contribute to safer and more secure driving. Details on this technology were presented at ITSWC 2012 (Intelligent Transport Systems World Congress). In Europe and the US, it is typical to park nose-first in a parking space and reverse to pull out. When backing out, however, if the driver is careless and makes an oversight, accidents causing serious physical injuries can result. The frequency of such accidents involving tragic injuries to family members is especially high. In the US, this led to the implementation of the Cameron Gulbransen Kids Transportation Safety Act(1). In Japan, on the other hand, it is typical to reverse into a parking spot, an uncomfortable maneuver for inexperienced drivers. These are reasons why various parking assist systems have come into commercial use, primarily involving the use of rear-mounted cameras. When a driver is backing up, a rear-mounted camera is only able to display the vehicle's surroundings. If the driver is not paying attention to the display monitor, there is no way to sound an alarm. There are also systems that use ultrasonic wave sensors to measure the distance to surrounding objects, but the range of these measurements is limited and their accuracy is not sufficient, resulting in many false detections or over detections, so they were unable to provide sufficiently effective warnings. Laser radars, on the other hand, are able to measure relatively longer distances with a high degree of accuracy, and they can be used to measure the location of vehicles. 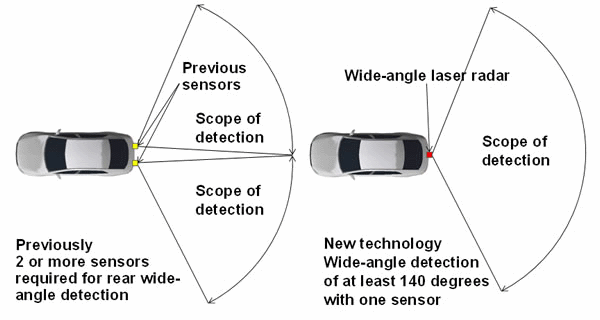 The breadth of their detection is relatively narrow, however, at no more than 60 degrees, so multiple sensors are required in order to detect objects surrounding the vehicle in three dimensions over a wide range. It has, therefore, been difficult to measure a broad range of objects with a high degree of accuracy using only a few sensors. Fujitsu Laboratories has now developed a 3D laser radar that is able to measure distances to objects over a wide detection angle range. It does this by using a newly developed scanning angle expansion lens to beam the laser over a wide-angle range, and a high speed, multipoint laser scanning system to detect a wide range at high speed. The newly developed technology has the following features. A newly developed scanning angle expansion lens beams a laser across an angle that is approximately four times as wide as the laser's angle of incidence (figure 1). 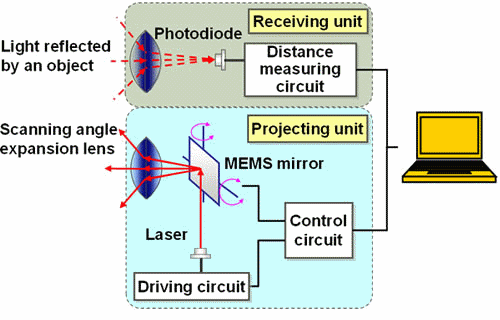 Through the use of a high speed laser scanning system that employs a high speed laser driving circuit and a MEMS (Micro Electro Mechanical Systems) mirror, a high speed, multipoint scanning system has been developed that enables 3D measurement at QVGA resolution of 76,800 pixels (320 × 240) across a detection range of 140 × 140 degrees horizontally and vertically (figure 2). In broad terms, the system is comprised of a projecting unit and a receiving unit. The projecting unit is comprised of a laser, a high speed laser driving circuit, mirrors for scanning, and a scanning angle expansion lens. The receiving unit is comprised of a photodiode, which receives the light reflected by an object, and a distance measurement circuit that measures the distance to the object. This technology enables 3D ranging of a vehicle's surroundings across a wide area, including from behind, using a minimum number of sensors. It could also be used to layer distance information from the laser radar on video camera images to build a vehicle backing support system with advanced features. Moreover, the technology enables the creation of systems that detect when objects are abnormally close. In this case it provides warnings when the driver is backing up a vehicle, which is when accidents often occur, or when backing into a parking space, which is difficult for many drivers. It is hoped, therefore, that this technology can contribute to safer and more secure driving. Fujitsu Laboratories plans to further expand the detection range of the super-wide-angle laser radar technology and work on making it more compact. In addition, through the development of technology that enables the integrated display of video images, it seeks to create systems for monitoring a vehicle's surroundings and supporting car parking or pulling out of a parking spot. Moreover, because the laser radar can detect the existence of people and whether a person is standing or sitting, for example, Fujitsu Laboratories also plans to expand the application of sensors beyond automotive applications into other security and monitoring applications.